The climate and topography of California’s Napa Valley are perfect for producing world-class wines, and are equally inviting for bike-loving wine enthusiasts. Immerse yourself in a land stitched together by stubborn farmers and captured by storytelling giants like Jack London and Robert Louis Stevenson. Self-guided travel is about building memories while the heavy lifting is done for you, allowing you to build your own adventure from the seat of your bicycle. This itinerary allows you to get the full experience of biking in Napa, with time allotted for wine country tours – so make this trip your own! Available May 1 – October 31. All accommodations are shared occupancy by default. Purchase this upgrade to have a room to yourself. Bike rental is available through AOA. *We cannot accommodate solo travelers on self-guided trips. Prices are based on your trip starting on Sunday. Possible increased costs for trips that start on other days of the week. This trip is available May 1 – October 31 upon request. One of the benefits of going self-guided is that your travel dates are dependent only on you. We are able to offer this trip at your convenience during the specified season. Please discuss your preferred travel dates with our staff upon inquiry. 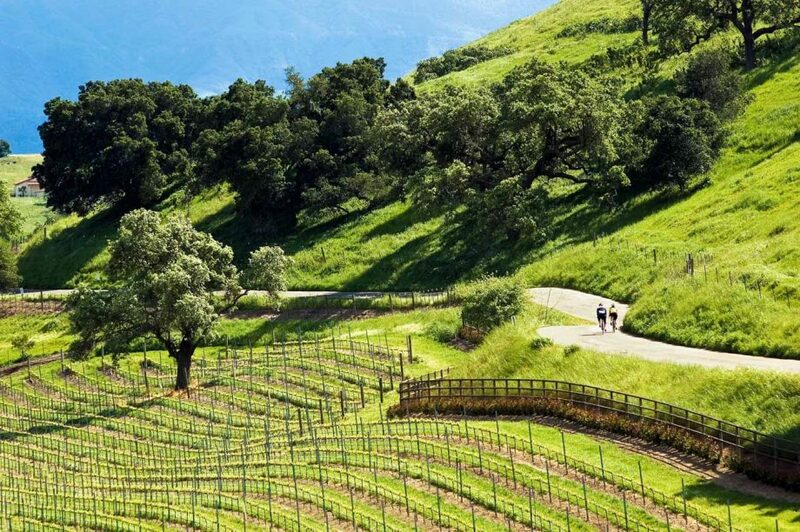 This self-guided trip is perfect for those looking for a leisurely cycling vacation in California's Napa Valley Wine Country. 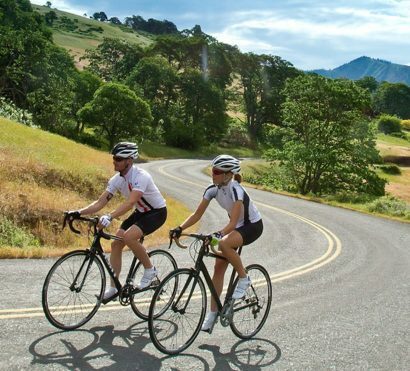 This casual cycling trip begins in Calistoga and makes its way towards the heart of Napa Valley and the famous Silverado Trail, rich in cultural and culinary delights. Take advantage of a soak in mineral-rich mud baths, taste world-renowned local fare, and enjoy the many styles of architecture displayed across these classic scenes. You will end your journey in Sonoma, CA, one of the best wine country destinations in Sonoma County, with a downtown plaza surrounded by one-of-a-kind restaurants and shops. 4:00pm | Upon arrival at the Calistoga Hotel in Napa Valley, one of our travel experts will meet you in the lobby and prepare you for the trip ahead! You will review the provided Route Book and all hotel reservations in detail. 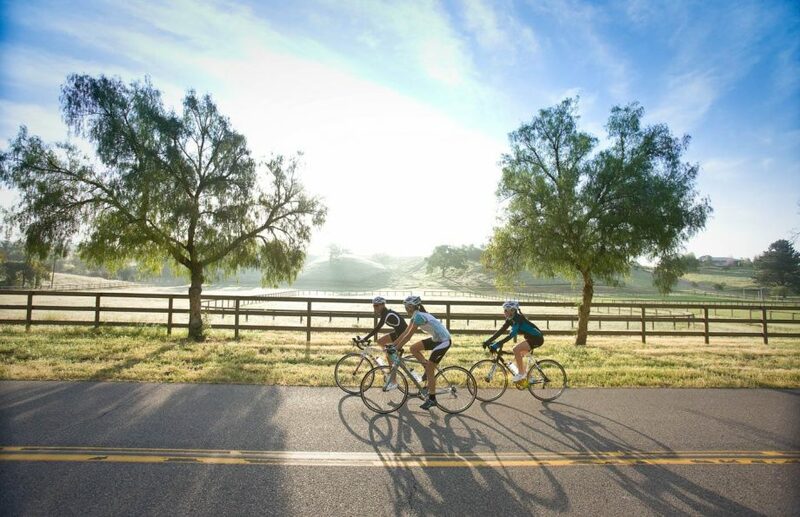 After getting to know you and the Napa bike rides you are looking for, our staff may suggest customized routes or activities to enhance your week. Next, they will provide a brief check over your bike to ensure you have a good understanding of the equipment and that it is set to fit you appropriately. If time and daylight allows, they’ll send you out on a short warm-up ride through the charming town of Calistoga. Today is a loop ride that explores the gorgeous scenery of northern Napa Valley. 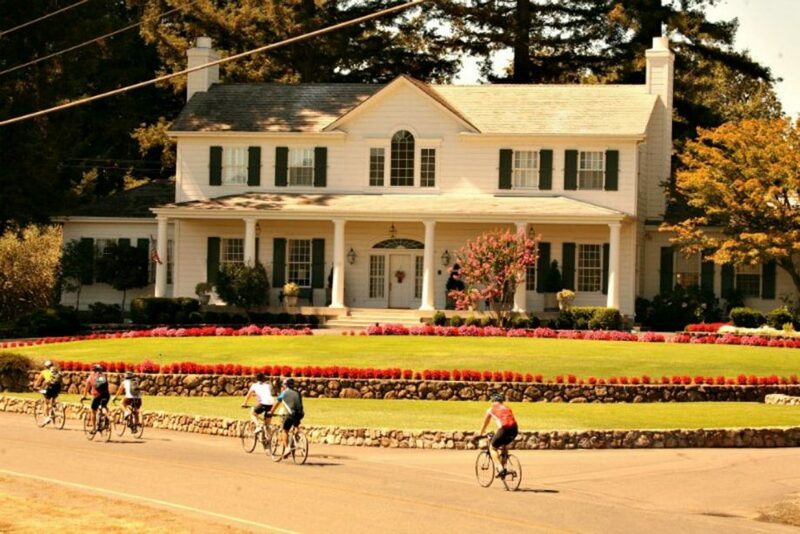 Cycle along lovely Calistoga back roads before climbing over the hills that separate Napa Valley from Knights Valley. Known for its warm days and cool nights, this is the warmest viticultural region in the county. The valley’s beauty and mineral-rich volcanic rhyolitic soils are as prized today as they were in ancient times. Turn into the intimate Franz Valley for a climb back over the hills into Napa Valley and then enjoy a gradual descent to downtown Calistoga. Wine tasting? 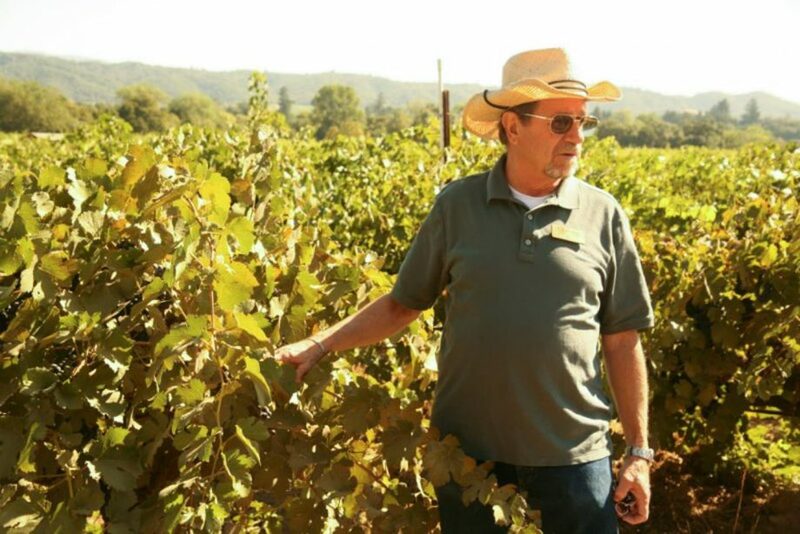 Calistoga offers numerous local tasting stops to choose from. Fees for tasting usually start at $10 and go up to $25/$35 per person. Leave your luggage at the bell stand and ride the famed Silverado Trail. Explore, swirl, sniff, sip, and cycle your way through Napa Valley, one of the most notable wine regions in the world. This road, which skirts along the east side of Napa Valley, has generous shoulders and minimal traffic. You will pass many incredible wineries and should have time to visit some on this leg of your journey. Your Route Book will provide suggestions on some of AOA’s favorites but can also help you find details on any spots on your “must see” list. You will also find wine tasting, and much more, all within easy walking distance of your destination in historic downtown Napa. Explore the local nightlife or perhaps enjoy a massage to shake out the past two full days of cycling. Escape to quiet mountain roads and ride Mount Veeder, a favorite loop for the Napa locals. The views from this road, and the light traffic, make for a spectacular and rewarding ride. After you reach the summit, it’s pretty much all downhill on Dry Creek Road back to Napa. As you cruise along, soak in views of small mountain vineyards and pass through shaded forests. If you prefer a shorter route today, an out-and-back on Dry Creek Road is an excellent option. The road follows Dry Creek from the Napa Valley floor up a long narrow canyon into the mountains. Total climbing is a little over one-thousand feet on road that gets a lot of shade from the trees that line the sides of the road. The wine country bike tour continues! Sonoma is located on the opposite side of the Mayacama Mountains, about six miles due west of Napa. Your route to get there curves around the southern end of these mountains through the Carneros region. The close proximity to San Pablo Bay brings in cool fog and breezes, making ideal conditions for cultivating the cooler climate varietals like Chardonnay and Pinot Noir. Have a stop in at Artesa Vineyard or Domaine Carneros for a taste along the way to Sonoma. End the day at Sonoma Plaza with its collection of fine boutiques, festive wine tasting rooms, and award-winning restaurants for you to explore. For a little extra mileage and scenery the Lovall Valley loop is an easy out-and-back from Sonoma that can be added onto your ride from Napa. The climb up Lovall Valley Road is not difficult and the scenic loop within the small valley make this a must do ride. Today you venture north through Sonoma Valley. Also known as Valley of the Moon, Sonoma was romanticized by famous author Jack London. 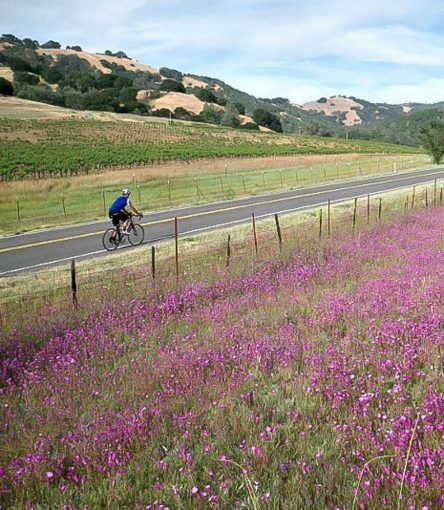 From the seat of your bike you travel through lovely Glen Ellen, see where Jack London lived, and continue north through Kenwood for a climb to Sugarloaf Ridge State Park. This gorgeous park contains the headwaters of Sonoma Creek. It runs through gorge and canyon, across the meadow floor, beneath scenic rock outcroppings, and is surrounded at times by redwoods and ferns. It’s worth stopping for a short walk along the creek to admire the scenery before you return back the way you came to Sonoma. If you are looking for something a little less ambitious today, ride instead to Jack London State Park near Glen Ellen. Perched high on Sonoma Mountain with over 1400 pristine acres and 26 miles of trails to explore, plus a rich, colorful, and well preserved history; Jack London State Park is an outdoor paradise. The climb on London Ranch Road is mostly gradual and along this road is the famous Benziger Family Winery, known for its bio-dynamic farming practices and fascinating history. End of tour services upon conclusion of the ride. You can add an extra night here tonight, but please book in advance. NOTE: Because weekend rates are so high in the region, we allow you to travel on to nearby cities/villages. An extra night tonight here at the El Dorado range from $265-$485 depending on season and room.